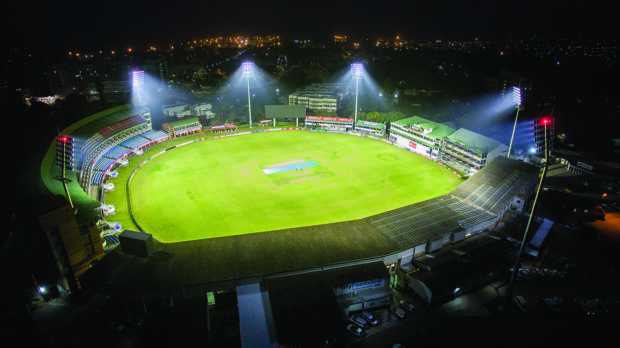 St. George’s Park Cricket Ground revamped its lighting system in preparation for the Mzansi Super League cricket event, South Africa’s own T20 competition, in November 2018, in which many top international cricket stars participate. Commissioned to install a Musco lighting system, Maritz Electrical offered St George’s Park one of the world’s top lighting solutions which is already in use at stadiums across the globe, including international arenas such as Formula 1 Grand Prix circuits; the Twickenham Rugby Atadium; Arsenal’s Emirates Stadium and many other international sports fields. The system offers significantly reduced maintenance and energy costs as well as a ten-year guarantee while meeting the ICC and CSA specified lighting level of 2500 lux (vertical) on the wicket and 1800 lux (vertical) in the outfield. The system was specified to be LED and not metal-halide.